7 Top Daily News on Social Media in Financial Services (11 December 2012): P2P Lending to be regulated in the UK, APAC insurers to focus on social media in 2013. This is our selection for Tuesday 11th December 2012. Please flag any missing major news and share your comments here on our blog, or via twitter (@Visible_Banking). Starting on April 2014 the peer-to-peer lending pioneered by UK firms will be regulated by the Financial Conduct Authority in order to acquire stability and credibility. More importantly, the regulation will make peer-to-peer a credible alternative to banks. The FDIC National Survey of both underbanked and unbanked Households found out several US citizens have low financial capability levels and lack access to mainstream financial products. But, mobile technologies may be able to close the gap. Thus, D2D Fund and CFSI are running the Financial Capability Development Competition to help change the people’s financial habits and behaviours. IDC Financial Insights projects that Asia Pacific insurers will increase technology spending, boasting the most aggressive year-on-year spending. It also suggests strategic investments to add value. However, insurance companies still need to reinvent themselves in order to take advantage of new growth opportunities. NAB has opened a social media command center that will be open 7 days a week in order to make banking with NAB easier and more accessible. NAB resolves hundreds of requests from social media in the form of comments and posts on different social media channels. Survey suggests that more than 1/3 of CEOs ignore the social media reputation of their company when making important business decisions. Many companies are still not ready to use social media to their advantage. They fail to embrace the fact that social media is no longer an option, but a necessity. Firms are considering increasing their expenditure in market data and integrating social media into their trading technologies to gain a competitive edge in 2013. A number of traders are now using social media to monitor the market although there is still no clear way to outline and sort social media data. The Agricultural Bank of China (ABC) held a marketing campaign to celebrate its e-Banking business‘ 10th anniversary. As one of the strategic pillar business of the bank, ABC’s e-banking promotes a new innovation to continue to advance Intelligent Banking in the information age. 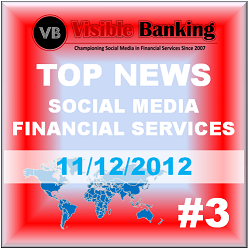 So, are you involved in any of the initiatives mentioned today in our top news on social media in financial services? Are you working on similar projects at your financial institution? We invite you to share your views and your own top social media news on our comment section or via twitter.